RVers as a rule are a friendly bunch, readily sharing information about the places they have been and the roads they have traveled. This sharing of information is often invaluable, whether you a looking for a good place to camp or want to know about driving conditions up ahead. Of course, when you have just met a stranger in a campground, you never can be certain that he knows what he is talking about. So where to go for trusted information? One good source is RVLife.com, where you will find the honest opinions of a well-traveled RVer in a blog called, “Adventures in RVing.” The writer, Dave Helgeson, is an enthusiastic RVer who has an observant eye and a knack for finding interesting places that you probably wouldn’t discover on your own. He can alert you to good places to visit and also point out pitfalls. Follow Dave’s weekly blog and you are bound to learn something that will be of use in your travels. Here’s an example of one of his recent posts that shows why you might—or might not—want to stay in a Montana campground. Overnight camping is free at a Montana city park, but look out for bears. During the early days of the Church, persecuted Christians would be thrown to the lions for entertainment by the Romans. From that, a saying developed about sharing the good news of Jesus first and telling would-be followers about the lions later. Kind of a good news/bad news scenario. On our recent RV adventure through Montana we encountered such a place. 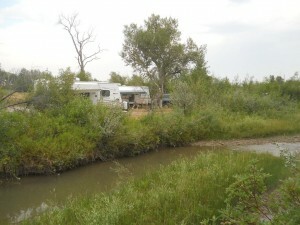 The town of Dupuyer operates a city park offering free overnight camping. The park offers picnic tables, fire rings, a play area, shade trees, a swimming hole, vault toilets, creekside campsites and more. Plus, it was right off the highway, making it a convenient overnight stop for us. The city had me at free, with all the other amenities being the proverbial frosting on the cake. Upon arriving we reviewed the posted rules for the park (not many) along with standard bear warnings we had seen everywhere else in the state. (Stow food, keep a clean camp, etc.) Then we noticed the electric fence along the neighboring property. We found it odd that the neighbors didn’t have any livestock, and every other wire of the fence was electrified, not just the top wire like cattle ranchers use. Upon taking a walk that evening, we stopped by the community bulletin board, finding a flier posted about the grant received to install bear resistant garbage cans and signage in the city park where we were staying. The flier went on to say Dupuyer Creek, which flowed through the park, was an active grizzly bear corridor, and there have been many bear sightings. Wow, now the fence began to make sense—which made we wonder, was the fence there to keep the bears out of the neighbor’s yard or the tourists contained in the feeding zone? Being lured into a grizzly bear den, just another adventure in RVing! That is a cute story and analogy. I wonder if I knew about the bears if I would have stayed there or not. I am a big chicken at heart. Seeing wildlife is one of the thrills and joys of RVing. They did fortunately give you a heads up though.